One of my long-term research and writing projects is a history of the type specimen as a visual form and professional practice. Written (and illustrated!) for design educators, students, and practitioners, it contextualizes this long-lasting and still-present form of typographic expression. It’s difficult to find historical context for images like these, because historical information about type specimens tends to be hidden away in highly specialized journals and limited-run small press books. As a design educator, it’s important for me to offer my students access to historical and critical context for the projects we undertake in the studio. This book project is all about sharing that kind of access with a wider public audience. 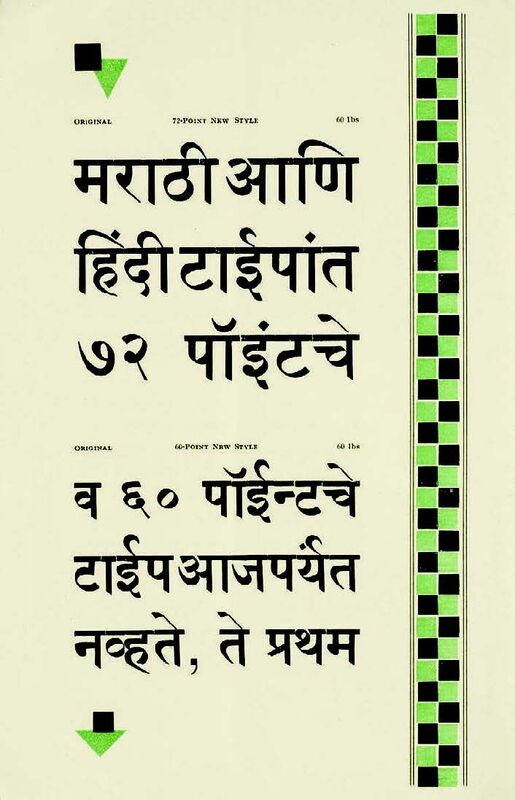 One of my priorities right now is expanding the image library to include global examples of specimens of non-Latin alphabets. It’s difficult but very rewarding to look for specimens which were produced locally, for and by audiences who used these languages for everyday communication. The process is ongoing and the details in the image above are snippets from my digital archives research process: a 1732 treatise on magnetism published by Ibrahim Müteferriqa in Istanbul, a stop along the way in my search for a locally-produced Arabic alphabet specimen; a page from Berthold’s 1924 specimen of Hebrew types, designed for the then-flourishing local Jewish community in Germany; and a page from a 1930 Gujarati Type Foundry specimen, printed in Bombay around 1930. It’s exciting to connect the visual research taking place in today’s graphic design studios with a diverse and (for most novice designers) as-yet unknown global history of typographic practice. The photo details in this post show less than 10% of the following publicly available images: Nick Sherman’s Creative Commons image shared under this license, a detail of this Wikimedia Commons image, and a detail from this Pinterest post. Cubism applied to jazz (1926) and the Hip Hop aesthetic (21st century). One of the graphic design projects I most enjoy teaching is a book design project where students collaborate to write brief introductory texts for assigned time periods in the history of graphic design, then source images to illustrate the texts and create an editorial slant of their own. Naturally, they also design the book itself, and we use a print-on-demand service to produce the 36-page books. Otherwise generic texts can be curated to show how graphic design and fashion design overlap, how women have been active in graphic design, how astronomers have used graphic design strategies to visualize the universe, or how restrictive the history of Euro-American design really is when contextualized globally. I recently presented this project and a cross-section of its results as a case study at a conference, so I’ve been looking back over past iterations and reflecting on what I learned from them. One of my all-time favorite results is a recent student book showing how Black designers are creating dialogues with the history of graphic styles through the work they do for contemporary hip-hop albums and posters. Teaching is a learning experience, and that’s why I love it. I constantly seek ways to diversify the projects I assign and the examples I show to be reflective of my students, their experiences, and the global community in which we live. But though my introductory lecture asked students to reflect (among many other things) on why images by Black designers don’t show up in generic histories of design, I never would have imagined this specific concept as a potential example of the “graphic histories” book project and I’ve learned so much from the student who did. About the images: 1926 New Yorker cover deploys the Cubist style. DJ Spinna fan art poster is by prop4g4nd4 on DeviantArt. Omar Musa’s World Goes to Pieces album was released by OBM Music in Australia, 2010. Montage of image details from JTB guidebook covers of the 1930s. It’s thrilling to share this link to the abstract for my article “How to See Japan” in the Journal of Design History. Fellow academics (and any other interested readers) are welcome to get in touch for a PDF of the article itself, which I’m allowed to share on an individual basis but not through online links or social media posts. Montage of details from eco-dystopian novel covers of the 1960s-70s. I’m currently guest editing a special issue of the visual communication design journal Visible Language and this work has been ongoing for quite a while. The issue centers the histories of designers, artifacts, practices, and global design communities that have been relegated to the periphery of disciplinary dialogues in western Europe and North America for far too long. During this process, I’ve discovered that I love editing for one of the same reasons I love teaching: it’s a chance to learn something entirely new about the practice and history of design. I’ve been an eager student of the authors I’m working with. Through this editorial adventure, I’ve learned about the history of typography and design in places where the local languages are Arabic, Danish, Hebrew (pictured), and Māori. The remaining details will have to wait for 2019, when the issue will be published. The photo in this post is a detail of Nick Sherman’s Creative Commons image shared under this license. “How to See Japan” is forthcoming in the Journal of Design History. Here’s its official abstract: The interwar English-language guidebooks published by the Japan Tourist Bureau utilized a diverse set of graphic design strategies on their front covers to communicate the cultural identity of Japan to anglophone tourists. Many of the covers borrowed the aesthetic conventions of European Modernism, rendering the Japanese landscape and its inhabitants familiar to the western tourist gaze. Conversely, others evoked the visual conventions of traditional Japanese painting and printmaking, signifying the exotic nature of Japanese tourism destinations. Adapted from both indigenous and imported visual languages, the JTB’s combination of graphic communication strategies functioned to construct a visual identity diverse in its component parts but cohesive in its over-arching received narrative. For anglophone viewers, the images depicted Japan as a destination simultaneously historical and modern, familiar yet exotic.